I have had an interest in receiving the images from the NOAA (National Oceanic and Atmospheric Administration) polar orbiting LEO (Low Earth Orbit) weather satellites for many years now. I have built several different antennas and a couple of receivers over the years and have used a couple of different, commercial, systems at sea. The satellites orbit at a height of around 540 miles in an orbit oriented so that they cover the whole planet twice a day, morning and evening. Each satellite provides 2 or 3 overlapping images at each morning and evening set of passes and there are usually three operational satellites. The APT (Automatic Picture Transmission) signal transmitted by the satellites has not changed since the 1960s and is a simple audio fax signal that is very easy to receive and decode. The signals are transmitted on several frequencies in the VHF band between 137 and 138MHz. 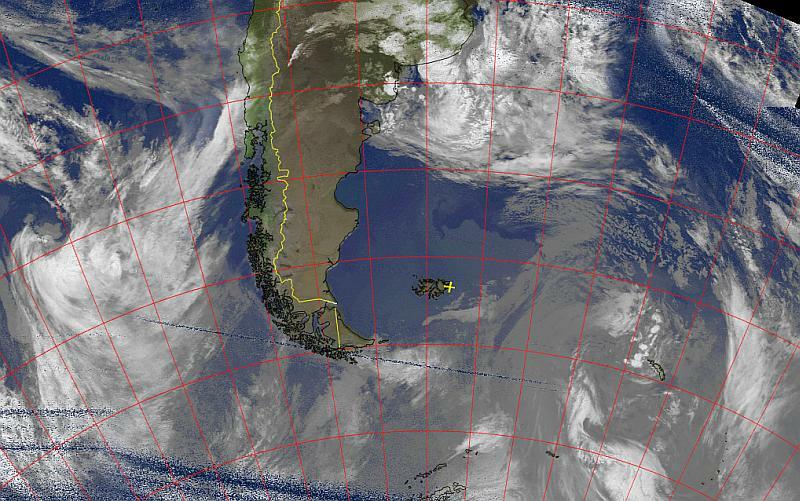 Thermal enhancement of an infra-red image clearly showing the cold Falklands Current flowing north of the islands towards the River Plate esturary. 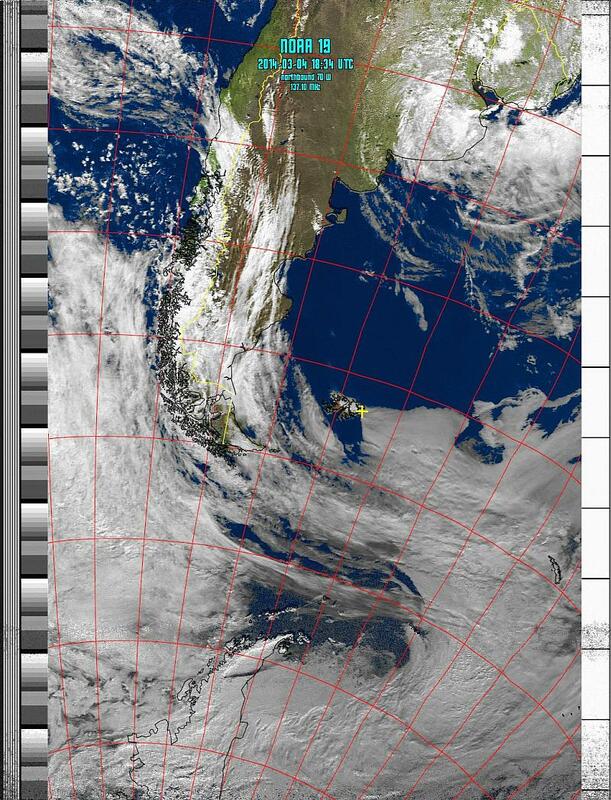 Apart from an interest in the technology and in the science behind it I find the images useful when viewed along with GRIB weather forecast files, and my own weather observations log, to confirm the current GRIB data and to look at the bigger picture. The satellites usually transmit two types of image side by side in the same fax signal. During the day when the sun illumination angle is high enough one is a visible light image and the other an infra-red image, at night both images are a variant of infra-red. 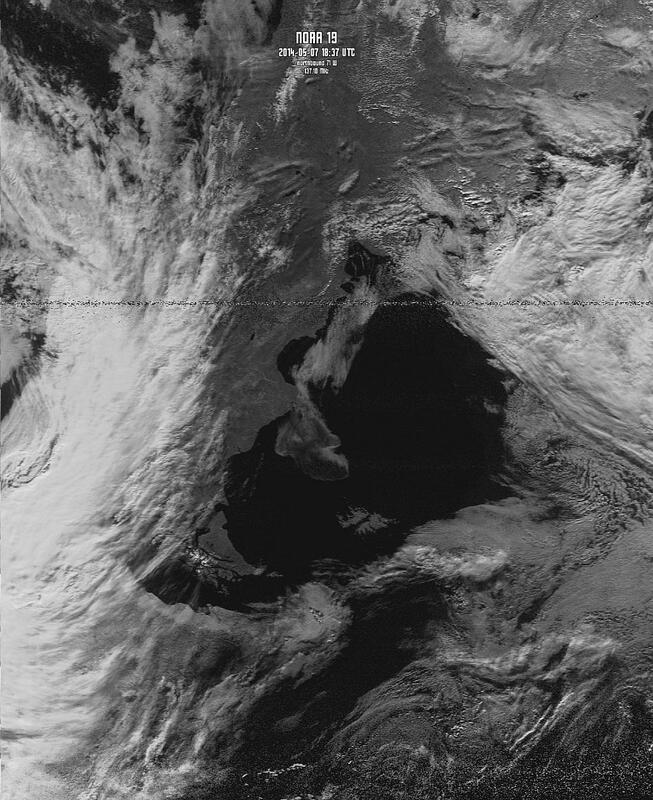 For weather purposes, and with my limited knowledge, I generally find the infra-red image to be the most useful as it provides a consistent view morning and evening and I can measure the temperature of the cloud tops; which gives me an indication of the intensity of the systems below. It is possible to see a lot more information in the images than just cloud patterns. Ocean currents and plankton blooms are often visible and larger ice-bergs and ice fields are also visible; the ice is best seen with good illumination in the visible light images, and the currents in the infra-red images. I have now settled on a commercial system for “Morgane”; the APT-06 receiver combined with MX-137 antenna from the WRASSE Electronic company of Germany. The images that illustrate this article with are all received with this system. This well proven design provides plug-and-play installation with WxtoImg software from Central North Publishing of New Zealand. The whole system is powered via the USB cable which controls the receiver. The turnstile type of antenna with its built-in low noise amplifier provides a more compact and robust installation than the large QFH (Quadrifilar Helix) type antennas often used and at sea provides comparable, if not better, results. This system does not add much demand to the boat’s power system and provided that the boat computer is on runs automatically to provide several images covering a radius around the boat of over 1000 miles every morning and evening. 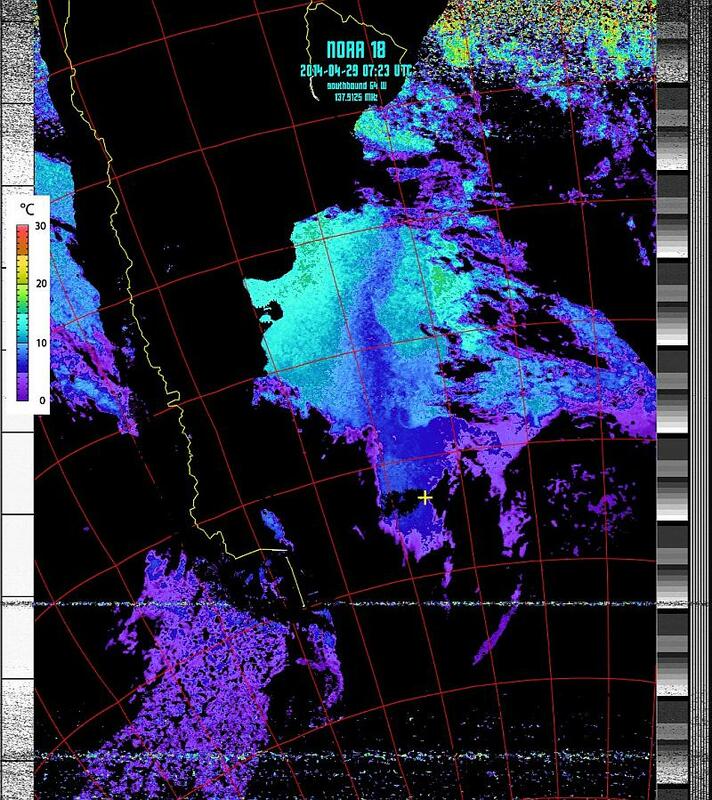 false colour visible light image stretching from Brazil in the north to the base of the Antarctic Peninsula in the south. Here are the links to a couple of books that I have found useful whilst learning about weather satellite images. I was very impressed by your recent images (on facebook) of lows near South America. I have been dicking around with QFH antennas and SDR dongles to no avail clarity wise so I reckon your rig has won me over. Awesome, thanks for sharing your setup. Yea the QFH antennas do work well if you can get them tuned up. They have an advantage on land but over water the turnstiles work just as well with the good ground (water) plane. Don’t worry about putting the antenna too high either. I’m planning to head west in December, destination unknown.